4/32 Mighty WurliTzer Theatre Pipe Organ. The first organ to be featured is the J. Tyson Forker Memorial 4/32 WurliTzer Theatre Pipe Organ installed at Grace Baptist Church in Sarasota, Florida. This is a big instrument with a myriad of tonal flavors, full MIDI implementation, a concert grand piano playable from the console, and a well equipped toy counter. 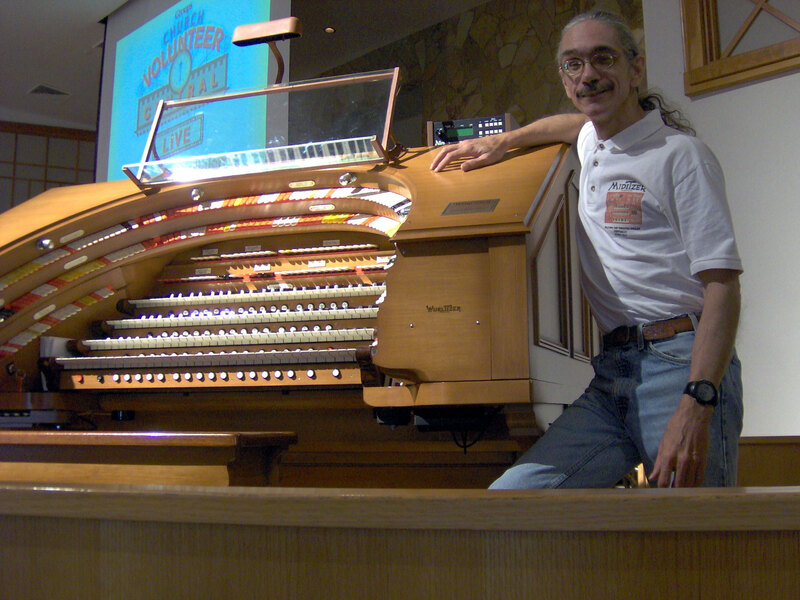 One of our featured artists, Tom Hoehn, gets to play this organ regularly. 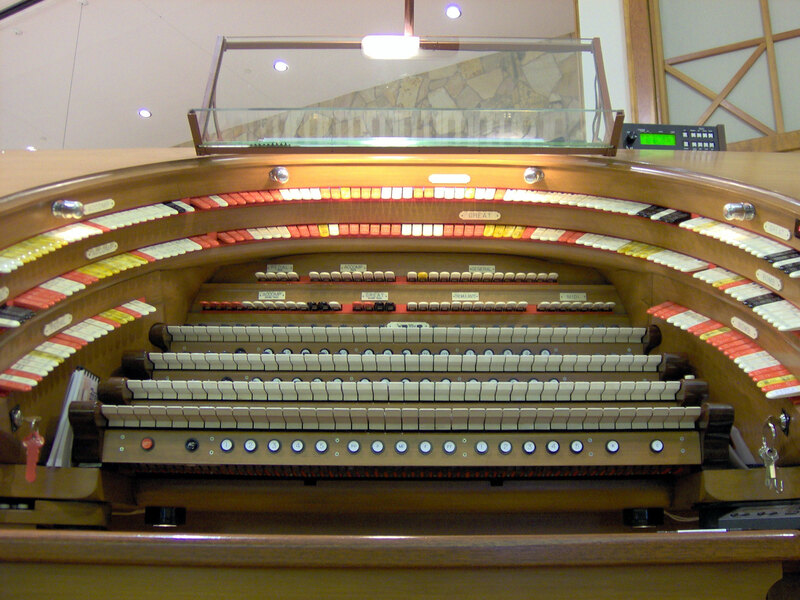 We are currently mastering a record for Tom here at Walnut Hill Productions, wherein he performed on this beautiful golden voiced Mighty WurliTzer. WurliTzer Opus 1569 began it's life in the Florida Theatre in Jacksonville, Florida. 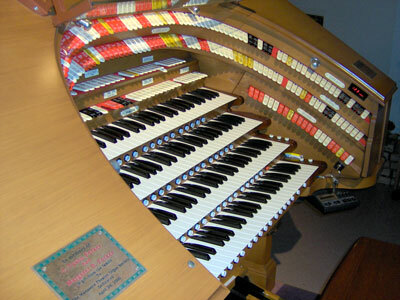 It was premiered in 1927 by non other than Bob Mitchell, who is profiled on the ATOS Journal May 2005 issue. It fell into disuse during the 1950's and eventually found it's way to the care of Bob Andre, Miami, Florida, who had it set up in one of his moving and storage business warehouses. One end of this warehouse he decorated as a "Theatre." 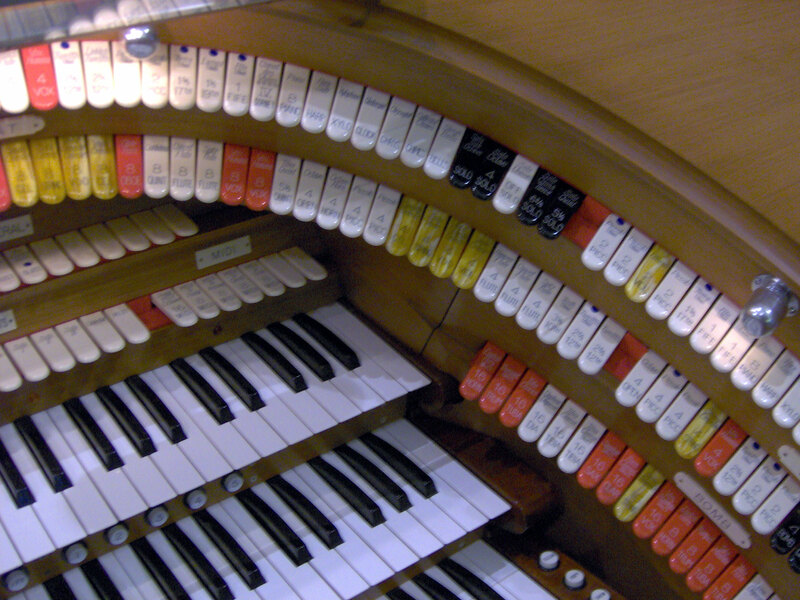 Opus 1569 is now in the loving hands of the Manasota Chapter of the ATOS, and will be one of the featured organs during the 2006 ATOS convention. 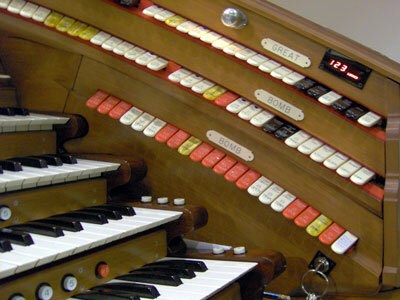 This one-of-a-kind instrument has been featured on many recordings by the best artists in the TPO business. Fellow Walnut Hill VTPO members Chaz Bender, webmaster of TheatrePipeOrgans.com and CinemaOrgans.com, and Tom Hoehn, our very own nationally acclaimed organist gets to play this organ regulary. Further down this page can be found some great selections for downloading from these Featured Artists. Below are some selected recordings which belong in your collection. Be sure to get them all. 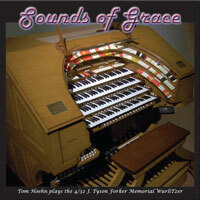 This is what the front cover of Tom Hoehn's CD, Sounds of Grace looks like. After a long wait, this album is now available for purchase. To learn more about this highly anticipated collection of inspirational music, click here. Tom has put a lot of hard work and money into this record and we are very proud to be involved in its production, as well as being able to offer it for sale in our General Store on the Featured Merchandise page. Jelani Eddington - Sarasota Spectacular! Jelani Eddington has a great album entitled Sarasota Spectacular! 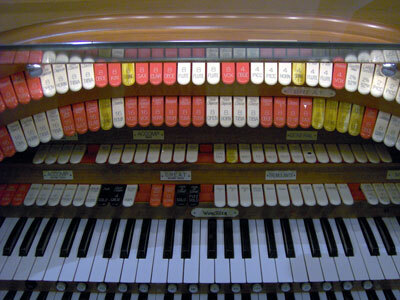 that features this beautiful example of WurliTzer craftsmanship. This recording is a must-have addition to any TPO buff's collection. To purchase a copy of this fine recording, click here. 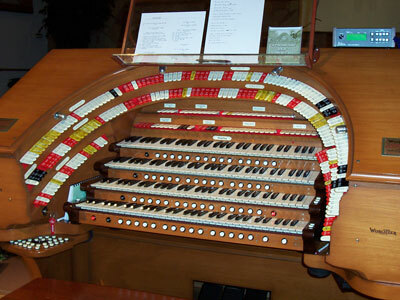 Jelani Eddington's latest CD comes to us from one of the finest organs on the American scene today, the 4/32 Mighty Wurlitzer at Grace Baptist Church in Sarasota, Florida. 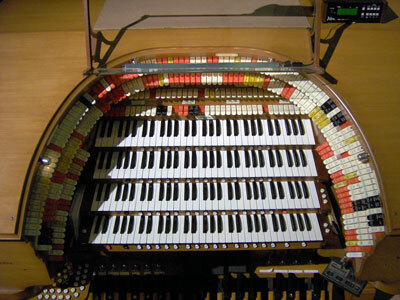 The majority of the instrument first saw life as a 3/15 in the Florida Theatre, Jacksonville. 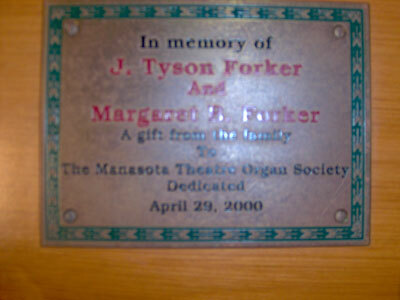 It was in the Miami home of Robert Andre for a number of years before making the move to Sarasota in 1996 with the generous support of J. Tyson Forker, successful publisher and former theatre organist. 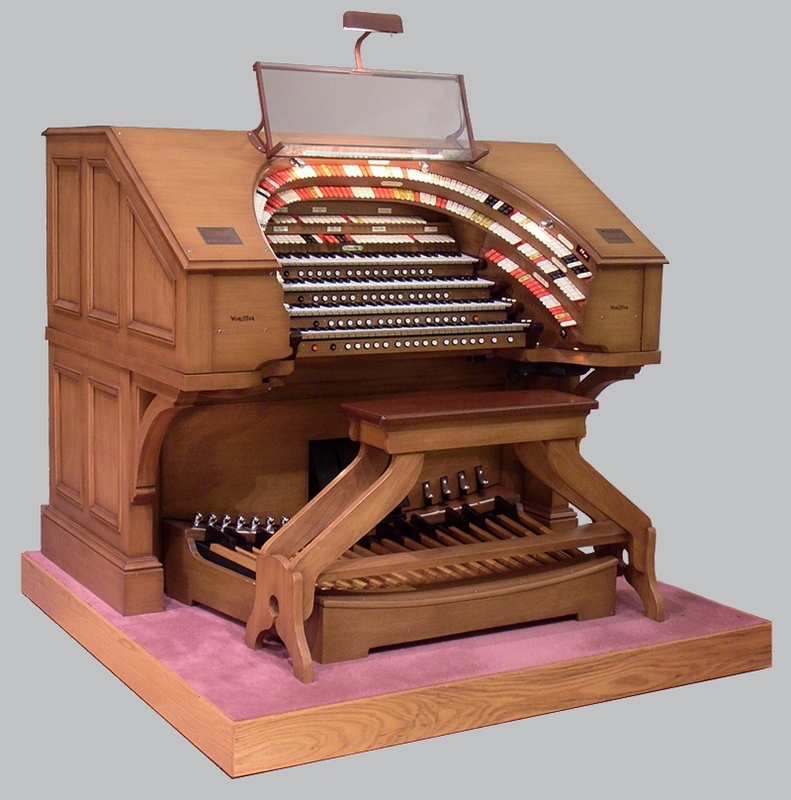 A new custom four-manual replica console from Ken Crome arrived on the scene in 1999, and the organ was premiered at the magnificent Grace Baptist Church, its new home, in April of 2000. Sadly, Mr. Forker did not live to see that day, but daughter Carole Scutt helped make sure that the project was completed under the capable hands of Allen Miller and Norman Arnold. 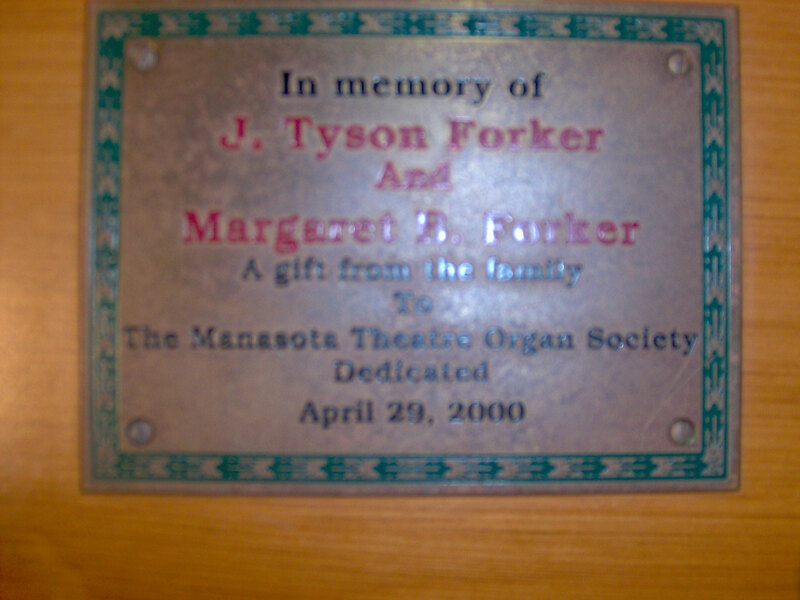 The instrument was dedicated to Mister Forker and his dear wife, Margaret, on April 29, 2000.
the J. Tyson Forker Memorial 4/32 Mighty WurliTzer Theatre Pipe Organ. 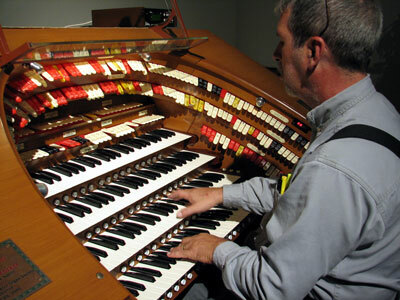 Mr. Arnold, it must be told, worked for months regulating the manual action to perfection, making this instrument one of the most sensitive to touch control. 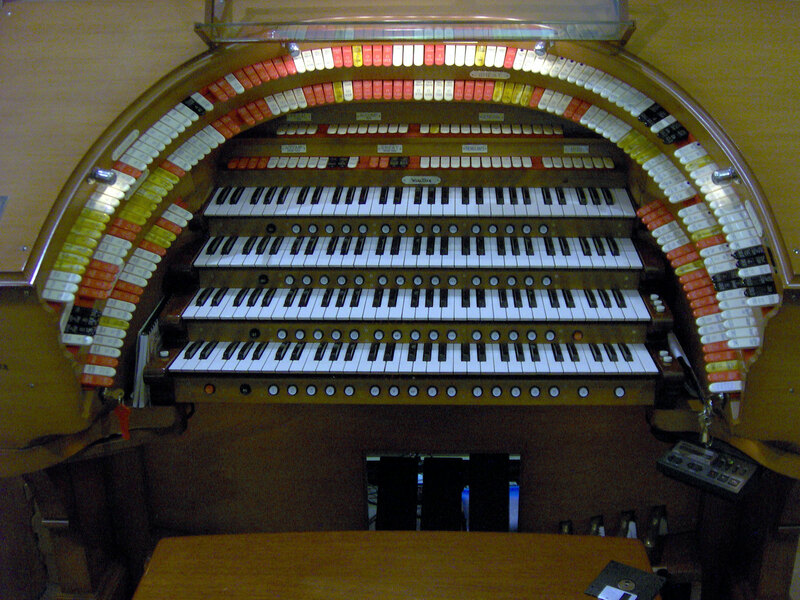 J. Tyson Forker Memorial 4/32 Mighty WurliTzer Theatre Pipe Organ. 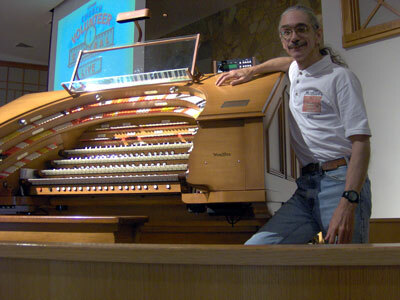 Allen Miller, long one of the finest organ men around, has produced an organ of seamless ensembles, beautiful solo stops, and excellent tonal percussions and traps. It serves equally well as a refined church instrument or a high-kicking showgirl at concert time. Jelani Eddington brings to the console all of the finest musical qualities, and one can truthfully say that, with him, perfection is only the point of departure. 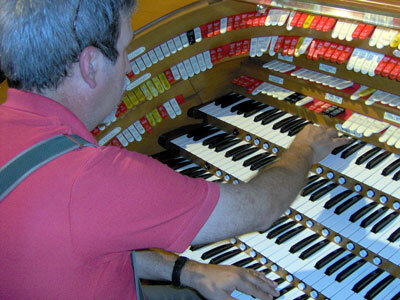 He has chosen a varied program of mostly familiar music, all played with elegance, finesse, and authority. The lavish 16-page booklet has plenty of photos, history, and a full description of the music. 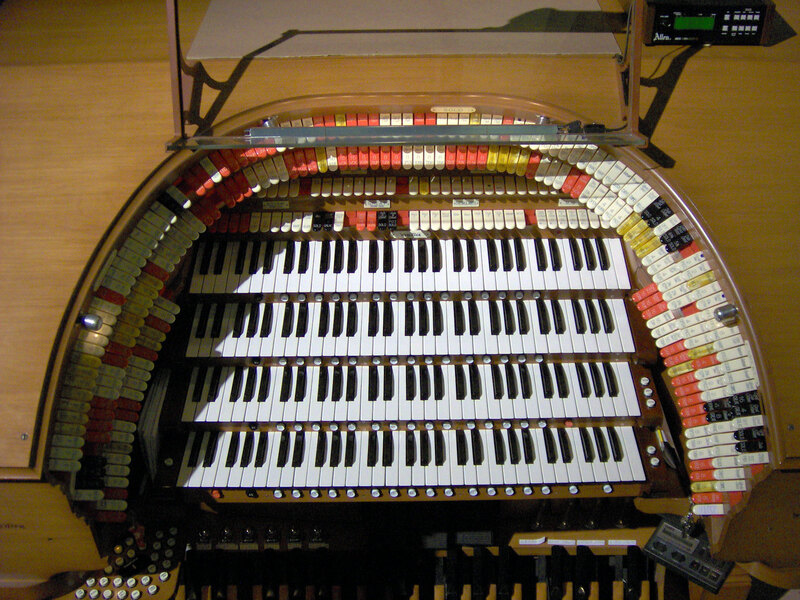 Knowledgeable organ buffs will also be pleased to see a number of "listening tips" in Jelani's notes, pointing out interesting registrations and techniques along the way. We are fortunate to get close to the J. Tyson Forker Memorial 4/32 WurliTzer Theatre Pipe Organ on a regular basis. 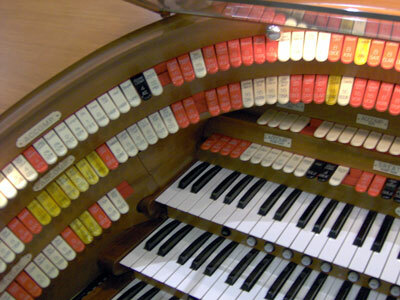 Therefore, we can take as many photographs as we want, along with recording the instrument at our leasure. Below are some of the shots culled from the hundreds we have taken so far. Here, we see the left stop bolster, showing the Pedal stops and some of the Accompaniment stops. The tongues are made by Hesco and are attached to real Syndynes that have a lightning fast action and are easy to toggle manually. Note the white engraving on the red tongues, making them very easy to read in dim light. Also note the key that turns on the blowers and the console. 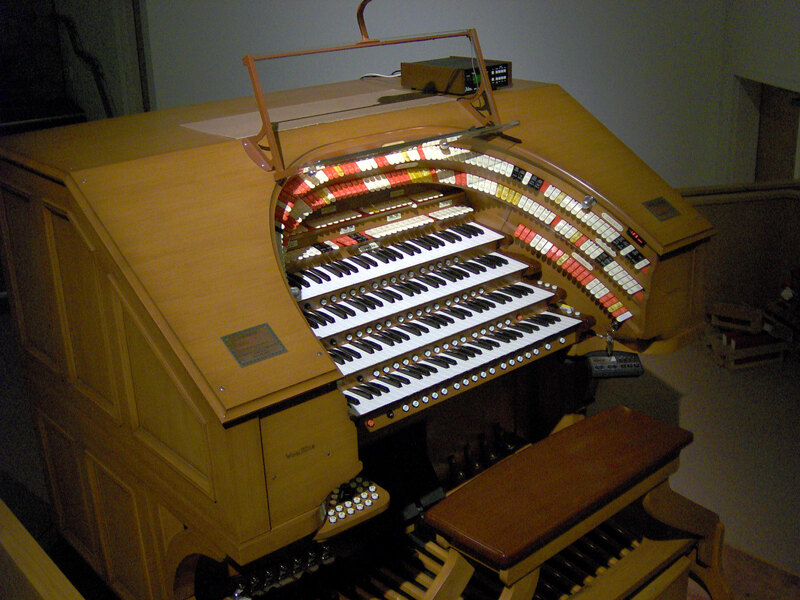 Here, we see the left bolster curving around toward the center and back rail, containing the Accompaniment stops and some of the Great stops. This curve is of the perfect radial dimension for the average sized human and makes getting to the stops extremely confortable and quick. Here, we see the center bolster full of Great stops and the fall board below with full size tongues on the back rail. Note the many Tremulants, Generals and a wealth of Second Touch voices, avaiable on the Accompaniment and the Great manuals. Here, we see the right bolster curving around from the center and back rail, containing the rest of the Great stops and the some of the Solo stops. Again, the curve is nice for quick and effortless access to all the tongues. 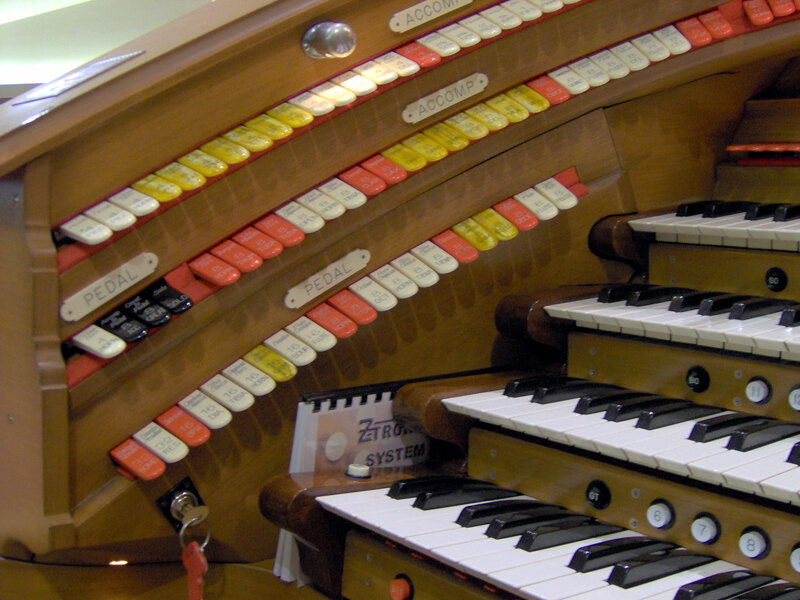 Here, we see the right bolster containing the rest of the Solo stops and the Bombarde stops. 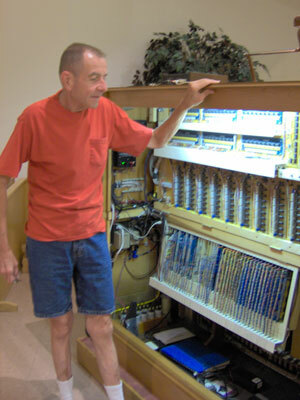 Note the three digit LED display for the Moving Combination Action memory levels and the key used to turn on memory access. 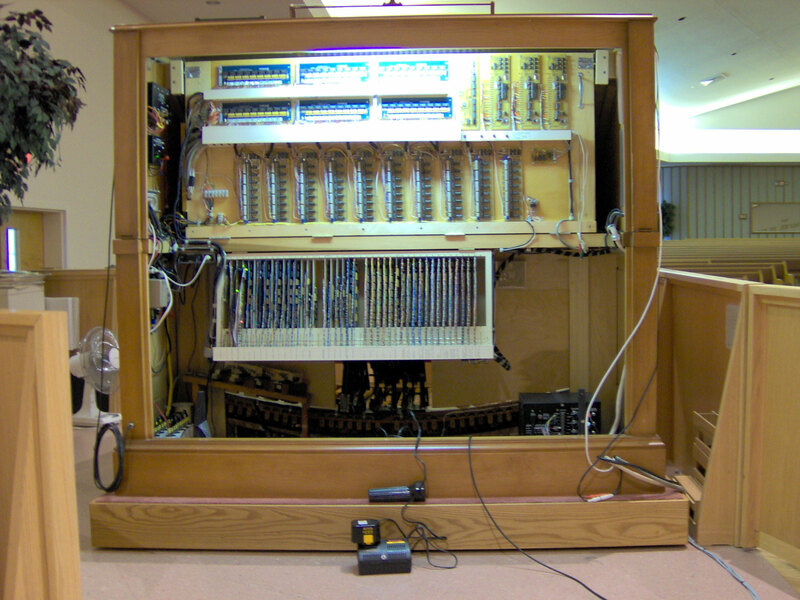 Here, we see the keydesk of this mighty instrument as viewed from the floor level of the sancuary. In this picture, one can appreciate the sheer size of this massive console. Here, we stood on a ladder and looked down on the console to get a shot of the stop sweep bristling with hundreds of stop tongues. Note the graceful curve of the bolster, done in the Empire style and finished in a five step antiquing process to give the look and feel of old walnut, a Ken Crome masterpiece, indeed! File size = 4.34MB, playing time = 4:41, bit rate = 128K/sec. File size = 3.38MB, playing time = 3:46, bit rate = 128K/sec. File size = 5.07MB, playing time = 5:30, bit rate = 128K/sec. File size = 2.40MB, playing time = 2:35, bit rate = 128K/sec. File size = 3.40MB, playing time = 3:41, bit rate = 128K/sec. File size = 2.68MB, playing time = 2:54, bit rate = 128K/sec. File size = 3.47MB, playing time = 3:45, bit rate = 128K/sec. File size = 3.88MB, playing time = 4:12, bit rate = 128K/sec. File size = 3.49MB, playing time = 3:46, bit rate = 128K/sec. File size = 3.04MB, playing time = 3:17, bit rate = 128K/sec. File size = 3.45MB, playing time = 3:44, bit rate = 128K/sec. File size = 2.20MB, playing time = 2:22, bit rate = 128K/sec. File size = 2.79MB, playing time = 3:01, bit rate = 128K/sec. File size = 3.56MB, playing time = 3:50, bit rate = 128K/sec. File size = 2.63MB, playing time = 2:50, bit rate = 128K/sec. File size = 3.34MB, playing time = 3:29, bit rate = 128K/sec. installed at Grace Baptist Church in Sarasota, Florida. 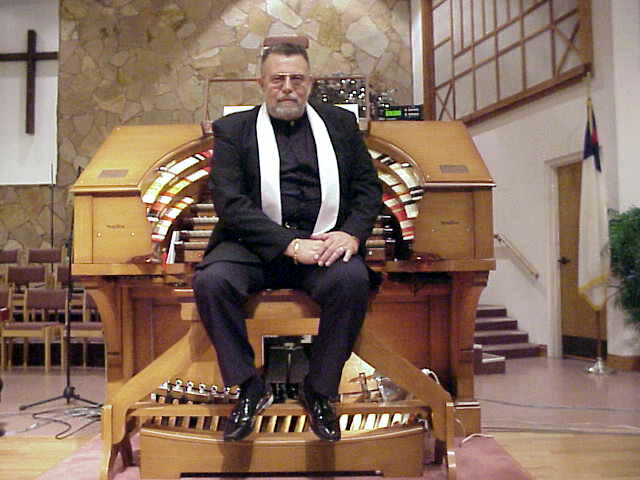 Below are fifteen selections from Tom playing the J. Tyson Forker Memorial 4/32 WurliTzer Theatre Pipe Organ at Grace Baptist Church, Sarasota, Florida. Playing time = 3:06, file size = 2.88MB, bit rate = 128KB/sec. Playing time = 3:58, file size = 3.68MB, bit rate = 128KB/sec. Playing time = 2:30, file size = 2.33MB, bit rate = 128KB/sec. Playing time = 2:40, file size = 2.48MB, bit rate = 128KB/sec. Playing time = 5:06, file size = 4.71MB, bit rate = 128KB/sec. Playing time = 10:14, file size = 9.45MB, bit rate = 128KB/sec. Playing time = 2:59, file size = 2.77MB, bit rate = 128KB/sec. Playing time = 1:33, file size = 1.46MB, bit rate = 128KB/sec. Playing time = 5:23, file size = 4.98MB, bit rate = 128KB/sec. Playing time = 9:10, file size = 8.46MB, bit rate = 128KB/sec. Playing time = 15:18, file size = 14.10MB, bit rate = 128KB/sec. Playing time = 3:05, file size = 2.87MB, bit rate = 128KB/sec. Playing time = 3:55, file size = 3.62MB, bit rate = 128KB/sec. Playing time = 4:07, file size = 3.82MB, bit rate = 128KB/sec. Playing time = 8:54, file size = 8.22MB, bit rate = 128KB/sec. for the monthly MTOS meeting on December 18th, 2005. 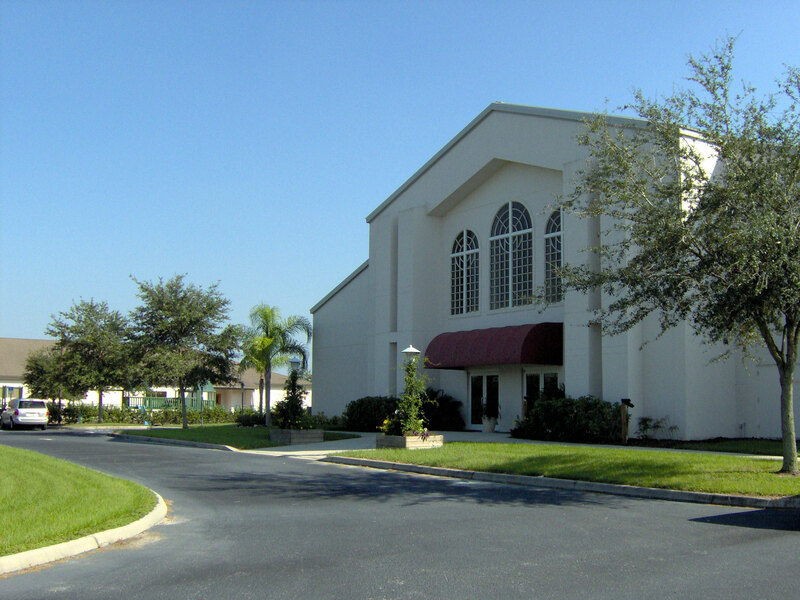 On December 17th, 2005 Tom Hoehn went to Grace Baptist Church to rehearse for his concert for the monthly MTOS meeting on December 18th, the following day. The Walnut Hill Productions crew went along and took some pictures and recorded the event. Below are some tracks from Tom's rehearsal session at the J. Tyson Forker Memorial 4/32 Mighty WurliTzer Theatre Pipe Organ. Playing time = 5:54, file size = 5.44MB, bit rate = 128KB/sec. Playing time = 6:05, file size = 5.61MB, bit rate = 128KB/sec. Playing time = 4:21, file size = 4.02MB, bit rate = 128KB/sec.